Are you losing customers at checkout because of PayPal? Are You Losing Customers Because of PayPal? Do you have a significant number of uncompleted e-commerce sales or the online shopping cart abandonments? Are you wondering why so many customers leave your website and never finish their purchase transaction? Apart from website errors, technical glitches and personal reasons, there may be another big problem: PayPal. I wrote this article after I noticed it's been the third time in one month I had to abandon my intention to purchase products from online sellers, leave their websites and look for the same goods elsewhere. All because there was no other payment option but PayPal. According to the latest research, 23% of shoppers will drop a checkout process if they are requested to register with the website, additional 12% will leave when they are asked for too much personal information. In other words, customers want a quick, simple, non-intrusive checkout process that will not demand more personal information than it is really needed for fulfilling the order. And while PayPal's so-called “guest” checkout may sound like a good option for the customers who don't want to register or sign up; when it comes to respecting customer privacy, PayPal may be the worst possible solution: intrusive and misleading, as the “no PayPal account” option is not what it seems. PayPal is infamous for their identity verification requirements that both violate the privacy and compromise the security of their customers. Those who have a PayPal account are familiar with emails demanding to submit a copy of their photo ID, driver's license, passport, utility bill or social security card to prove their name, address, date of birth, national tax ID or social security number. Many also have a first-hand experience with their accounts being suspended, money locked away, or some account functions disabled. However, PayPal modus operandi affects not only those who signed up of their own volition. Privacy infringements are also concerning those who have never had nor ever intended to have anything to do with PayPal. Many businesses use PayPal services to accept payments on their websites. PayPal claims to be a faster, safer way to pay and get paid online , and while it may be convenient for people who already have a PayPal account and don't care about their violated, PayPal can be of a great inconvenience to the rest and lead to a loss of new customers. It often feels that PayPal is imposed on people: it is widely used and some businesses offer PayPal payment processing as the only way to pay for their goods and services. PayPal boasts on its website: Founded in December 1998, PayPal is the leading global online payment company. PayPal has 117 million active registered accounts and is available in 190 markets. 117 million active registered accounts is an impressive number, and, at first glance, it justifies the ubiquitous obtrusion: it seems reasonable for a seller to presume that the customer either already has a PayPal account or is eager to create one. However, let's take a closer look at which came first — the chicken or the egg. Is PayPal imposed on people because it is so big, or is it so big because it is imposed? Is PayPal really as big and safe as it claims? Have a PayPal account? Log in to your account to pay. Don't have a PayPal account? Pay with your credit or debit card. So far so good. If the buyer already has a PayPal account, the purchase proceeds trough PayPal as usual. The trouble starts when the person doesn't have a PayPal account nor has any desire to get one. 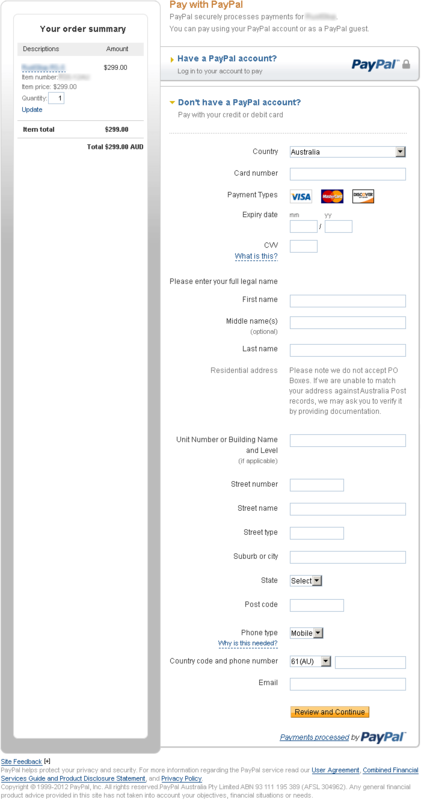 Long, intimidating and intrusive PayPal checkout form that demands too much personal information. Reasonable online payment-processing services don't ask for your full legal name. PayPal demands enter your full legal name... First name, Middle name(s), Last name . Reasonable payment processors only require the form of your name that matches the one printed on your bank card, and most reasonable banks allow their customers to choose a shortened form of their name for the cards. Reasonable payment processing services don't insist on residential addresses and don't reject PO boxes. After all, what's the point in having a PO box if you are not allowed to use it? PayPal demands the residential address: note we do not accept PO Boxes. If we are unable to match your address against Australia Post records, we may ask you to verify it by providing documentation . PayPal demands this even though many people use their PO boxes as their postal and billing address with their credit card providers. Reasonable services do not demand a phone number. A person has every right not to have a phone number at all: it not issued for free to every person, nor did PayPal pay for anyone's phone to demand that they have one. Strictly speaking, a residential address is not a mandatory attribute of a free individual either. PayPal prefers to pretend that they are not aware of this fact, or they simply don't believe in freedom, all “for our own protection” of course. The demands and restrictions in this checkout form was the point when I decided I will not trust my personal information to a paranoid money monster, but the curiosity and the attitude of a privacy advocate enticed me to interview a few people, do some online research and investigate the matter further. Fine-print, PayPal style: some of the information below was obtained from other people and was not verified by the author's personal experience. Please contact the author if you notice any discrepancies, and the corrections will be made. Let's suppose we are still okay to give up the convenience and security of having the purchase delivered to our PO box. We enter our full legal name, residential address and phone number, supplied our credit card details, email address, and... on the following page PayPal demands our date of birth. No other online checkout service ever asks for that! PayPal falsely states Australian Government requires us to collect your date of birth . This is false! Date of birth is not legally required for making online payments, and never has been. Moreover, the date of birth is often used by Australian Government agencies as an identity verification point, and, contrary to PayPal's statements, the Office of the Australian Information Commissioner (ex Office of the Privacy Commissioner) strongly recommends not to disclose it to anyone online. Same happens in other countries: PayPal claims that it is the government requirement to demand personal information such as date of birth, residential address, photo IDs and other documentary proof, yet no other online payment services in those countries requires this information, nor can PayPal supply the name or number of the statute of the law that allegedly requires them to violate the privacy of people in such manner. What registration? What account?? We are confused... We just want to pay this one time and get the product, we don't want to spend five hours reading the endless fine-print or sign up for anything! If we keep reading, PayPal keeps on talking about registering for PayPal services, signing up and some accounts. If we continue through the privacy violation process (aka PayPal checkout), eventually we can make the payment. However, at the end it becomes clear that PayPal will retain all the transaction details including the full credit card details. After that, PayPal sends a series of manipulative emails to coerce the buyer to provide a password and, if they do, they end up with a PayPal account pre-filled with their personal info PayPal harvested during the one-off purchase. PayPal keeps the data in its database for a long time, even if the customer resists and does not create a PayPal account. The data is kept ready for a future account creation, “just in case”. To log in and pay with a PayPal account. To pay and end up with a PayPal account. PayPal is constantly working to ensure security by regularly screening the accounts in our system. We recently reviewed your account, and we need more information to help us provide you with a secure service. Until we can collect this information, your access to sensitive account features will be limited. We would like to restore your access as soon as possible, and we apologise for the inconvenience. [Date] We noticed some unusual activity on a credit card linked to your PayPal account. As a security precaution to protect your account until we have more details from you, we've place a limitation on your account. In this email, PayPal claims that they have access to the customer's credit card account and can see some unusual activity there. PayPal is attempting to scare and manipulate the customer into a deeper relationship with them. PayPal will not give up: the emails may continue for years. After all, PayPal has to reach their next target — 118 million registered accounts. With PayPal, what should be a one-minute purchase, becomes an hours-long ordeal of filling forms and reading the fine-print, and a years-long struggle with personal data retention. PayPal tries to disguise this behaviour under a standard bunch of excuses, such as to protect privacy and security of the customers, to offer businesses a convenient tool for accepting payments, and to represent a faster, safer way to pay and get paid online . Protect privacy? That's what PO boxes are for, which PayPal doesn't allow. No, it is definitely not about privacy. PayPal insists that their service allows people to send money without sharing financial information, with the flexibility , but in reality there is no flexibility and, while the financial information may not be passed to the seller, PayPal will email out customer personal information such as residential addresses and full legal names to the sellers. How this information will be kept and used after that, nobody knows. This may jeopardise personal safety more than any disclosure of financial information. PayPal claims to protect customers' financial information, such as credit card number, yet they readily disclose lots of personal information with every single transaction: while the credit card number stays hidden, your name, residential address, phone number and e-mail address are transmitted to the sellers. PayPal doesn't want people to realise that a bank card number is very easy to chance if you suspect it might have fallen in the wrong hands, but you can't chance your name and home address every time a dishonest company misuses it. Nobody in sound mind would give their full legal name, home address, phone number and e-mail every single time they pay in a supermarket, petrol station or a restaurant. So, though PayPal may offer some minimal protection of financial information, they collect and share enough of your private information needed for a full-blown identity theft. Any careful customer can see through the smoke-screen and sense an enormous money-making machine that intrudes people's privacy, deceives, lies, forces its customers to disclose unnecessary personal data and tricks people into creating unwanted accounts. Any careful merchant realises that PayPal uses them as a free recruiter by essentially forcing their prospective customers to sign up for PayPal. You can see how PayPal managed to get their 117 million accounts: people end up with PayPal accounts against their initial intentions. If you run an online businesses, you can see now how you can be losing your customers to PayPal's way of operating. It is obvious that a reasonable business should always offer their customers an alternative to PayPal for making payments. In my case, I nearly given up my intention to make a purchase and left the seller's website for the fourth time this month, but luckily the company was located in Australia, so I was able to phone them (poor guys were shocked to learn that having PayPal as a single option was harming their business) and happily arrange a payment via direct bank deposit, completely avoiding PayPal with its intrusive forms, and receiving my purchase to a PO box. Before we can offer you certain products and services, federal regulations require that we collect specific information to verify your identity. This information includes your name, address, date of birth, and National Tax ID or Social Security number. We haven't been able to verify your identity using the information you provided, so we need some additional documentation from you. Until this issue is resolved, you'll be able to log in to your PayPal account but you might not be able to add money to it or use some of your account features. Please log in to your account and go to the Resolution Center to find out what you need to do. To help confirm your identity, please send us a copy of your photo ID that shows your name and address. Waiting for your response link: "resolve"
Please make sure that the documentation you provide is up-to-date and legible. The name and address on your documentation must correspond with the information registered on your PayPal account. Your documentation cannot be older than 6 months. Send only documents received by mail (online statements cannot be accepted). Send all the information and documents required as soon as possible to complete the review process. To confirm your address, please send us a copy of a bill that shows your name and address. Helpful documents include a utility bill, a cell phone bill, an insurance bill, or a tuition bill. Provide documentation that shows your Social Security number. Helpful documents include a copy of your Social Security card, a pay stub, or a government-issued document. Please provide the documents requested below. We'll review your account status after we receive the information we've requested. 1. Your documents need to be valid and legible. 2. The submitted information on the documents must correspond with the information on your PayPal account. 3. Documents can't be older than 6 months. Isn't this a bit too much for something that started as a one-off payment on a website that promised: PayPal does not require you to have a PayPal account to make a payment, this is an optional step ? If your privacy, security and low levels of stress are important to you, it may be a very good idea to think twice before dealing with a website that accepts payments through PayPal only. Apparently, PayPal sends emails like this even to the customers who have been using their PayPal account for more than a decade. The person who forwarded me the text has been using PayPal since 1999 and said: I called Paypal and was told that it was not Paypal requiring these documents, but it was the federal (US) government. When I asked why no other online retailers required this level of information, I received no answer. When I asked what statute of US law required this, they put me on hold for about 5 minutes and then told me they could not find it.